BRIDGEWATER, N.J., April 17, 2019 /PRNewswire/ -- Forbes has named Sanofi one of America's Best Employers. This is the first time Sanofi has appeared on the Forbes list. "It is an amazing accomplishment when employees voice their pride and it leads to recognition," said Clint Wallace, Senior Vice President Human Resources, North America and Global Head of HR, Digital and Analytics. "We are honored to be named by Forbes as one of America's Best Employers." Forbes collaborates with analytics company, Statista, to compile the list. Statista surveyed 50,000 U.S. employees working for companies with at least 1,000 people in their U.S. operations. All the surveys were anonymous, allowing participants to openly share their opinions. The respondents were asked to rate, on a scale of zero to 10, how likely they'd be to recommend their employer to others. Statista then asked respondents to nominate other organizations in their respective industries. The final list ranks the 500 large (more than 5,000 U.S. employees) and 500 midsize (1,000 to 5,000 U.S. employees) employers from 25 different industries that received the most recommendations. 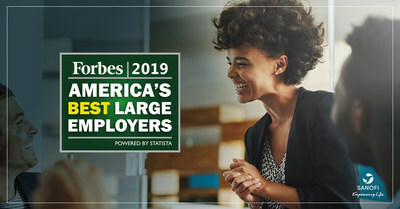 View the full list of America's Best Employers 2019. This is one of several workplace related awards bestowed on Sanofi in the past 12 months. The company was named to Working Mother's "100 Best Companies" and "Best Company for Dads" lists, DiversityInc's "Top 50 Companies for Diversity" and the Human Rights Campaign's "Best Places to Work for LGBTQ Equality." Sanofi strives to provide employees with comprehensive benefits and resources to help support their desire to thrive in every dimension of their lives including physical well-being, financial well-being, work-life balance, making a difference, and inclusion and diversity. Learn more about careers at Sanofi.